Your Stourbridge News is now available as an App for iPhone and iPad. Download your FREE App from the app Store today! It brings you the very best news, sport and features from in and around Stourbridge on your device, published in exceptional clarity, with an incredible touch screen experience allowing you to swipe through the paper. The latest edition will be viewable from 7am each Thursday! Plus full access to previous /archived editions too! Now with added Newsstand functionality.... you will automatically have all of your new editions pushed directly to your device through Newsstand ready and waiting for you to read! Flip your device and read the newspaper as a double-page spread or full screen single page, tap the page selector to choose a specific page to fast-navigate to. You can also download and save individual pages to enjoy offline and when you are on the go. The App features search functionality to find key-words relating to recent content, a zoom function to enable clearer reading of selected articles and social networking integration to keep your friends and social-circles up to date with all the latest shared news and features from Your Stourbridge News. The Kindle Fire is Amazon’s answer to the iPad - a full colour 7-inch touchscreen portable tablet that seamlessly connects to the internet via wifi. You can download and read your favourite newspapers and magazines direct from Amazon’s Newsstand, buy e-books, watch the latest HD movies or play games - even when you’re offline! The Stourbridge News is one of the first UK newspapers to be made available on the new Kindle Fire. Subscribers are able to view a full-colour digital edition of the paper in a bright, crisp format from the day of publication, from wherever they are in the world! 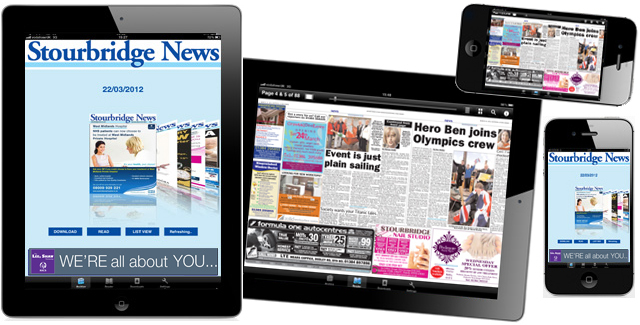 Your Stourbridge News is now available as an App for most Android phones and tablets. Subscribers are able to view a full-colour digital edition of the paper in a bright, crisp format from the day of publication, from wherever they are in the world! If you don't have one of the three options above then you can still access Your Stourbridge News on the move from 7am each Thursday morning. Just go to stourbridgenews.co.uk/e with your Smart phone's browser or scan the QR code below. ** Not currently available on Windows 7 Smart Phones. You can continue to view the e-edition of Your Stourbridge News which has been available for more than two years, from 7am each Thursday. View the latest edition in page flipping format and access the entire archive of the online e-edition. Add your e-mail adress and we will send you a weekly e-mail reminder to let you know when the latest edition is available to browse.